1) Wash your hands. Anthrax is primarily a disease of the skin. Soap and water will remove the vast majority of spores, should you become contaminated with them. Keep your fingers out of your nose. Thorough cleansing is a key to avoiding problems in the first place. 2) Cutaneous infections are most likely when spores contaminate a wound or are scratched into the skin. These infections produce sores which are easy to recognize, and easy to treat. 3) Pulmonary infections are much more difficult to contract than cutaneous. They are more likely in persons with acute respiratory infections or otherwise debilitated. Once contracted, early diagnosis is important but difficult because the symptoms are “flu-like.” A combination of chest pain, dry cough, profuse sweating and deep feeling of “not being oneself” should raise concern. 4) Treatment (in the extreme unlikelyhood that you contract anthrax) is most straight forward with simple penicillin G. Erythromycin, tetracycline and a variety of other antibiotics are also highly effective. Broad spectrum antibiotics such as Cipro (with all their deleterious side effects) are not appropriate without clear evidence that the bacteria are resistant to most antibiotics. Anthrax has little or no history of antibiotic resistance. NOTE: I have compiled the following information on anthrax from a variety of texts and my lecture notes. It is still a “work in progress,” with a few rough spots yet to be polished up. However, I believe that the facts they contain should be helpful in current discussion about the perceived threat from anthrax. Anthrax is a disease predominantly of ruminant animals and their handlers, variously known as “Woolsorter’s disease,” Splenic Fever, Charbon, or Milzbrand. It has received enormous attention as a means of biological terror in the United States following the 11 September 2001 destruction of the World Trade Center buildings. Because it is possible to disperse anthrax spores in the air (though with some difficulty), anthrax is touted as a leading candidate for “terrorists” to use against populations. However, many irrational fears attend this possibility, and a hysteria is sweeping across the United States in which every unknown powder is seen as “anthrax.” It is worth a closer look at the organism, how it is transmitted, its treatment and control so that our actions may be based on science rather than irrational fear. It is for this reason that I post these lecture notes on the web. The British in 1941 tested an aerial anthrax bomb on tiny Gruinard Island off the coast of Scotland. The 60 sheep placed there as ‘guinea pigs” were all killed by the germ warfare bonb. Unfortunately, the island remained contaminated with viable anthrax spores for more than 40 years, making it uninhabitable until protests in the 1980s led the British government to sterilize the entire island with burning followed by treatment with formaldehyde.(!) The United States actively pursued the development of anthrax as a biological weapon. It seems be significant that the strain which was used in the US attacks during the Fall of 2001 appear to be identical to one developed by the US Army for germ warfare. Bacillus anthracis, the causative agent of anthrax, is a large Gram positive rod, forming serpentine chains (streptobacilli) with ends squared off at regular intervals. They are facultative anaerobic bacilli. They are easy to culture, forming sticky colonies, with tiny “medusa heads” extending out. It liquefies gelatin, stabs producing “inverted fir tree” in the gelatin. It is distinguished from other Bacilli by its non-motility and presence of a capsule. spores (central spores no wider than bacterium) are seen in 2-3 day old cultures, but not in clinical specimens. They resist heat and certain antiseptics for moderate periods of time. capsule is a polypeptide of poly D-glutamic acid, and is a hapten (forms active antigen when combined with other molecules). colonies are round, and appear like “cut glass” or “ground glass” in transmitted light. They are gray and non-hemolytic on Blood Agar. virulence dependant on (single) capsule (anti phagocytic) and toxins. Virulence associated with rough colonies (?). Anthrax is primarily disease of herbivores, especially sheep, goats, cattle and horses. It infects man rarely. The agent is found in soil and on vegetation upon which grazing animals become infected through injured mucous membrane, when spores are found on spiny or irritating vegetation.. Spores are released in great numbers when the animal dies and decomposes, contaminating both the carcass and soil. The spores enter the soil where they are viable for decades. “Incubator areas” have alkaline or neutral calcareous soils in which the bacterium can multiply under favorable conditions. Outbreaks occur primarily in warmer seasons. Biting flies may transmit during epidemic, but are thought to be of little importance. Humans are accidentally exposed via contaminated animals or animal products, a particular hazard for veterinarians and farmers. Products (often imported) made from infected animals have caused recent human infections in the U.S. including such diverse products as bone meal, shaving brush bristles, hair or wool in textiles (especially alpaca wool, goat’s and even camel’s hair), hides and leather goods, goatskin drums. Handicrafters and hobbyists working with leather, hairs and wools at risk if materials from endemic areas. Oil cake and tankage made from contaminated materials can transmit anthrax. There is considerable variation among species in susceptibility: Guinea Pig are highly susceptible and rats resistant. Anthrax has been endemic in southern Europe, parts of Africa, Australia, Asia and North and South America. It persists in arid deserts of Middle East, Asia, Africa, Australia and South America with the most cases reported from Iran, Turkey, Pakistan and Sudan. It is relatively rare in the US, but last year, 500+ cases in Texas were recorded in White Tailed Deer. It has occurred in livestock in South Dakota, Nebraska, Arkansas, Mississippi, Louisiana, and California as well. In infected tissues, bacterial capsules remain intact, and the organisms become surrounded by large amount of proteinaceous fluid due to the toxins released. There are however few leukocytes in non-immune animals. The bacteria rapidly disseminate, and lymph nodes are a common site of bacterial growth, leading to enlarged, hemorrhagic nodes. The highly fatal inhalation form of the disease is due to such infested nodes in the space between the lungs, an area called the mediastinum. This hemorrhagic mediastinitis is commonly known as “wool sorters disease.” From these infected nodes, the bacilli can easily reach blood. In resistant animals, massive accumulation of leukocytes keep infection localized. Chains of large Gm positive rods are easily distinguished by microscopic examination of a Gram stained smear of lesion pus. Humans are moderately resistant to the disease, with 20,000 to 100,000 cases per year worldwide. Infection acquired via one of three routes, through the skin, by inhalation, or by ingestion. Cutaneous infection constitute 95% of infections, and are acquired through minor abrasion, injured skin or at pressure point of contaminated hide against skin. Rarely, it is contracted by inhalation of spores, causing “Woolsorter’s disease,” (often through the processing contaminated goat hair). According the to Merck Manual, “Inhaling spores under adverse conditions (e.g.. the presence of an acute respiratory infection) may result in pulmonary anthrax which is often fatal.” Infections due to ingestion are rare in humans. It is not communicable from person to person. The incubation period is generally 3-5 days. Spores germinate in tissue at site of entry, lead to gelatinous edema. The pathogens spread by the lymphatics to blood stream shortly before (and after) death. It can be spread among animals via biting flies, insects and vultures, but this mode of transmission is thought to be rare. Cutaneous: In man, a malignant pustule forms: 12-36 hours after entry via a scratch, a painless but itchy red-brown papule forms. It rapidly progresses to an oozing ulcer surrounded by vesicles containing bacteria. Finally, it turns into a necrotic black ulcer (eschar) from which infection can disseminate to septicemia. This black sore give the disease its name because it appears like coal (anthrax is Latin for coal). Disseminated anthrax can lead to massive edema. Mortality for untreated cutaneous anthrax is 5 to 20%. Microscopic examination and culture of skin lesions showing large Gram-positive bacilli (no spores) is suggestive of anthrax. Specific fluorescent antibodies confirm the diagnosis. Inhalation initially mimics viral respiratory illness with fatigue, fever and headache. (“flu-like symptoms”). Key differentiating signs and symptoms distinguishing inhalation anthrax include: chest pain, dry cough, profuse sweating, and a deep sense of “not being oneself.” Note that it does NOT include stuffy or runny nose or sore throat characteristic of upper respiratory infections. It rapidly progresses to diffuse pulmonary involvement, to respiratory failure. The mortality rate is high even when treated due to tardy diagnosis, ~95%. Ingestion very rare in humans, but also with high mortality. Nausea, vomiting anorexia, fever are characteristic, often with bloody stool. Penicillin is the antibiotic of choice. For patients who are allergic to penicillin, many other antibiotics are effective, including erythromycin, tetracycline and chloramphenicol. The typical treatment for cutaneous anthrax is a 7 day course of Penicillin G, 600,000 U IM. Ciprofloxacin (Cipro) is being widely touted and there has been a stampede to buy it up by the frightened public. This broad-spectrum antibiotic is very expensive and has serious possible side effects. It is an illogical choice to treat anthrax, especially when simple penicillin G is effective and readily available. Furthermore, doctors should not be prescribing antibiotics for patients in the absence of indications. It only contributes to the appearance of antibiotic resistant bacteria. Because the anthrax bacterium has had little exposure to penicillin it is likely to be sensitive to it (as opposed to many other common bacterial infections). Indeed, widespread use of Cipro against this anthrax is unwise because it will favor development of resistance in common pathogens. As always, no antibiotics should be taken without clear indication of bacteria infection. Basic polypeptides kill anthrax, including polylysine. Herds at risk should be vaccinated, and animals infected should be culled immediately, and all anthrax-infected carcasses should be burned or buried in deep lime pits. It is difficult to eradicate due to long-lived spores in soil, with no easy method of disinfecting soil. Vaccination with live attenuated bacilli was suggested by Pasteur, who, in 1881, grew the bacteria at 42-43 C for several months. This is near the limit of temperature requirement for the bacillus. After repeated culture at this elevated temperature, he found that it had lost much of its virulence, and when injected into cattle and sheep, protected them from infection. However, this protection may not be of long duration. Humans who are at particular risk can be vaccinated as well (veterinarians, animal handlers, persons working with animal carcasses or products, etc). Animal products which can carry spores can be autoclaved to destroy the spores: hides, bristles, hair. All work with Bacillus anthracis should be carried out in biological safety cabinet. Protective clothing and gloves worn gloves should be used when handling infected animals. Alcamo, Fundamentals of Microbiology, 5th Ed., (1996). p. 256-258. Birge, Edward, Modern Microbiology Principles and Applications, (1992). p373. Jawetz et al. Review of Medical Microbiology, 9th, (1970). Connective tissue consist of cells embedded in an extracellular matrix. The matrix consists of fibers and ground substance. The characteristic traits of different classes of connective tissue are due to differences in the composition, relative density and arrangement of its components. Note how each of these connective tissues is unique in composition, and the manner in which that is related to its function. 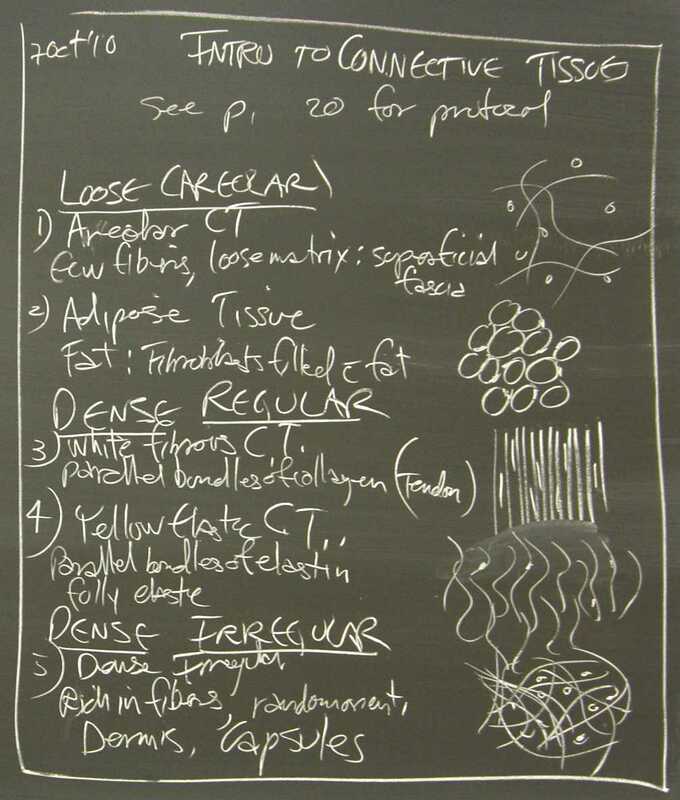 Black board summary of traits of various types of connective tissue. 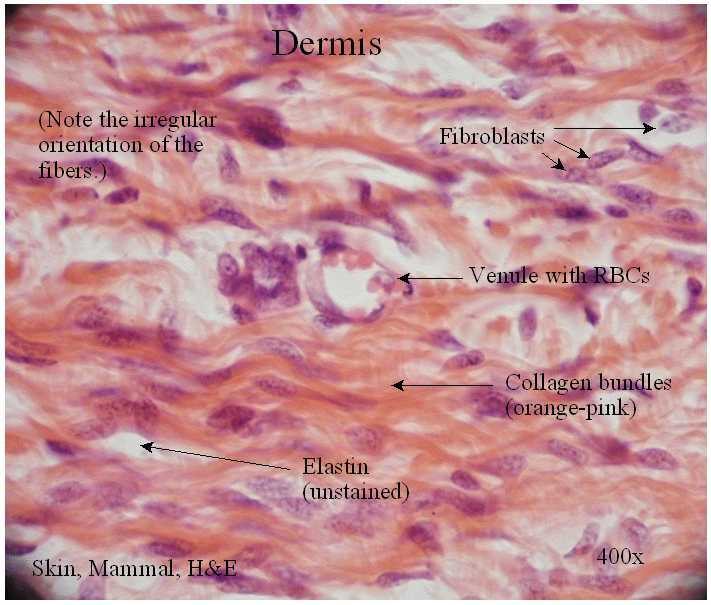 Here is superficial fascia showing collagen fibers. 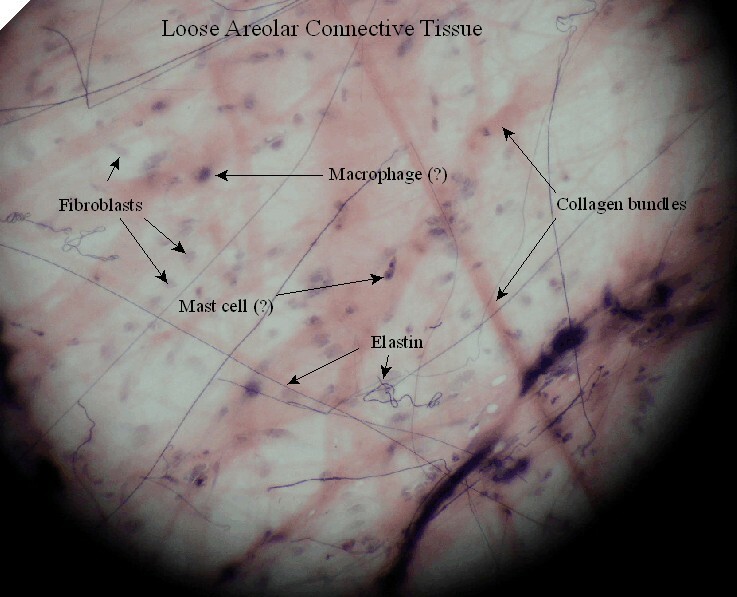 Here is a labeled view of loose areolar connective tissue. 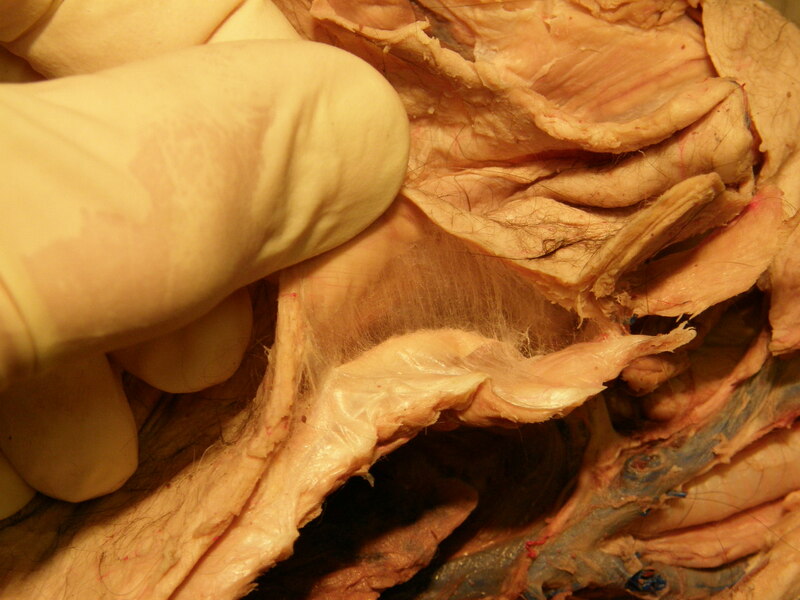 Note the trabeculae (partitions) also composed of reticular fibers. 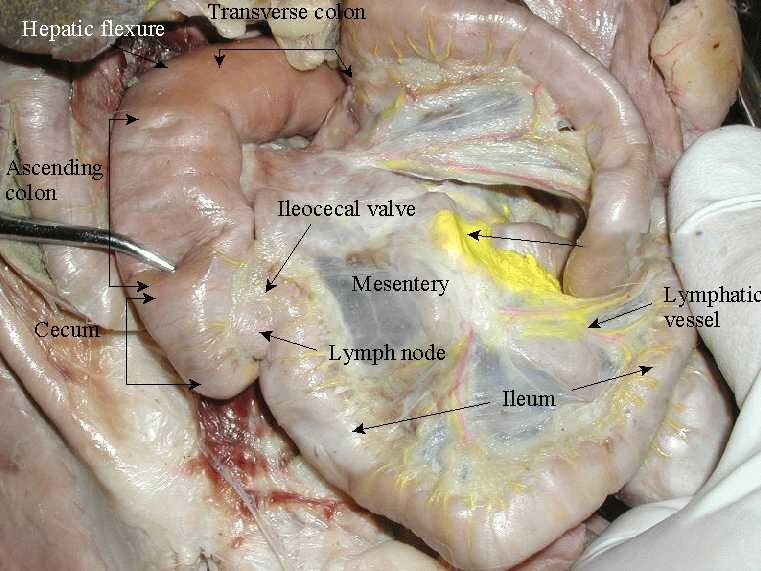 Here is a labeled version of the Dense Regular Connective Tissue. 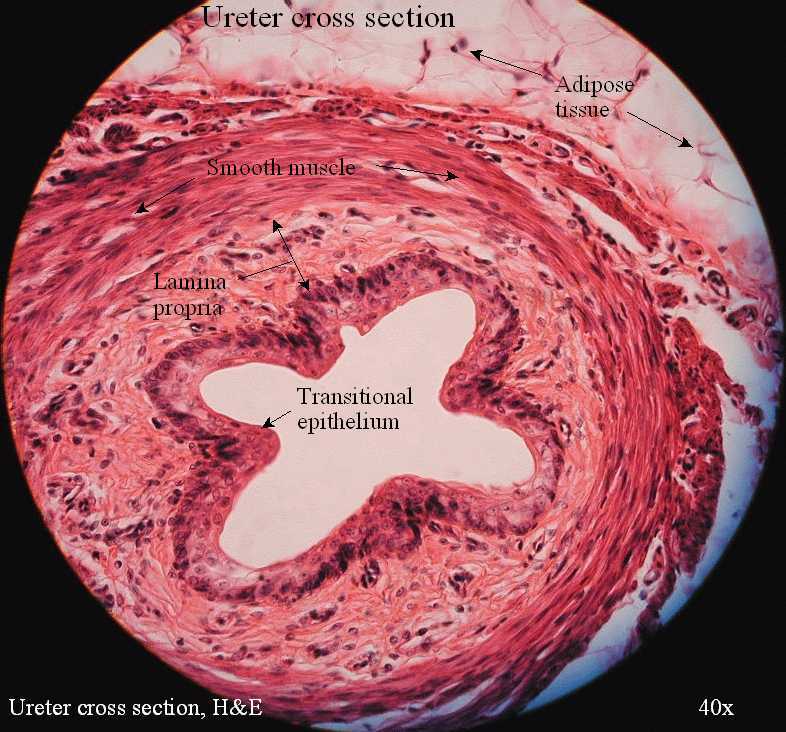 Here is a 100x view of a cross section of skin. Note that the epidermis is on top, and the dermis underlies it. venule Here is the dermis labeled. Identify the listed features, and illustrate a typical 400x field and, as always, give a brief description of the function and/or significance of each feature. Forms models for immature bones. Forms epiphyseal cartilage on long bones by which they grow. Gives shape to nose, trachea, etc. Connects bones as with ribs to stermum. 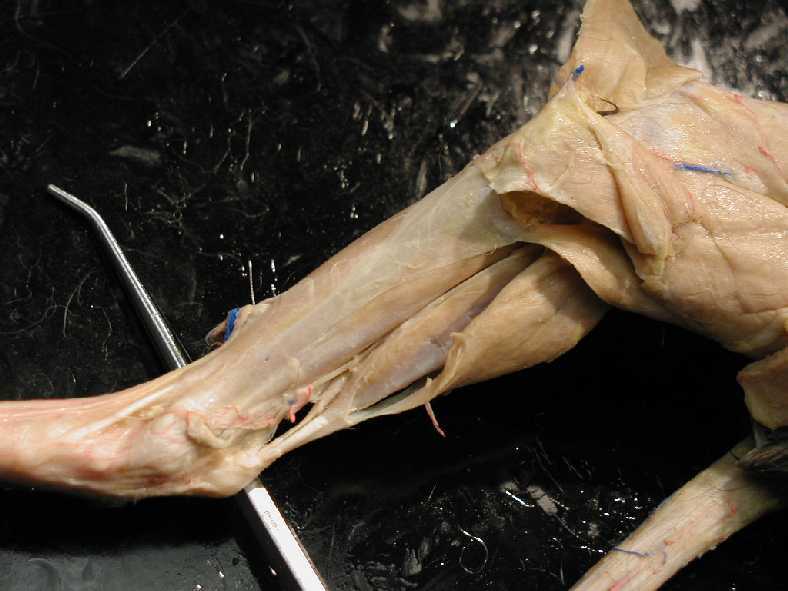 Covers the mating surfaces of bones in sinovial joints. It is resilient and shock absorbing. Collagen is the primary fiber, chondroitin the major component of ground substance. 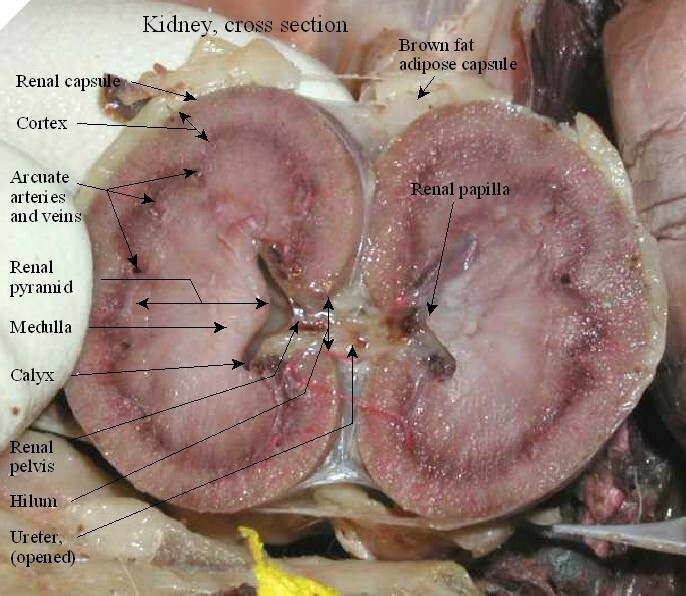 Here is a labeled view of hyaline cartilage and associated tissue. mucus acinar gland (tracheal gland) makes mucus which “floats” on top of cilia. 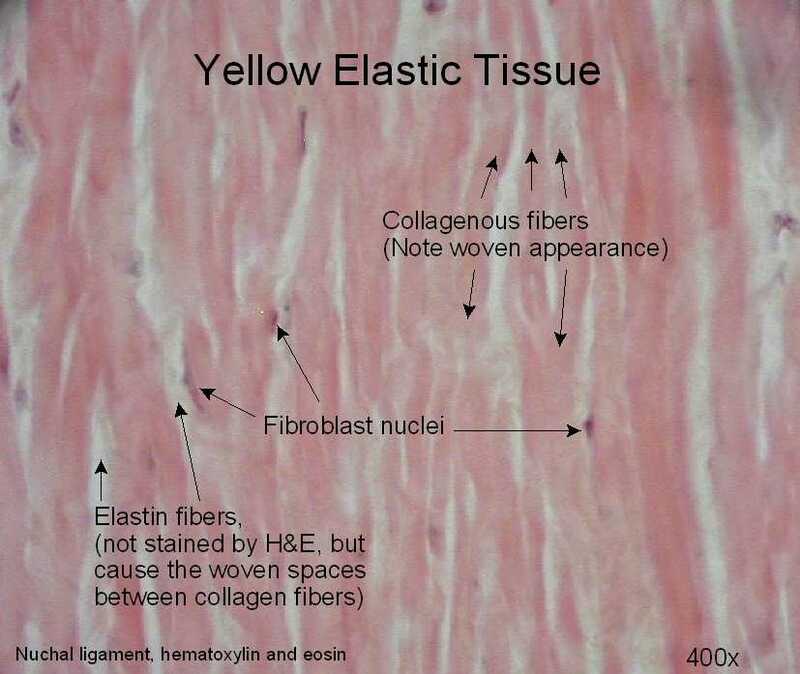 Similar to hyaline cartilage, but elastin is the predominant fiber, giving the tissue great elasticity. 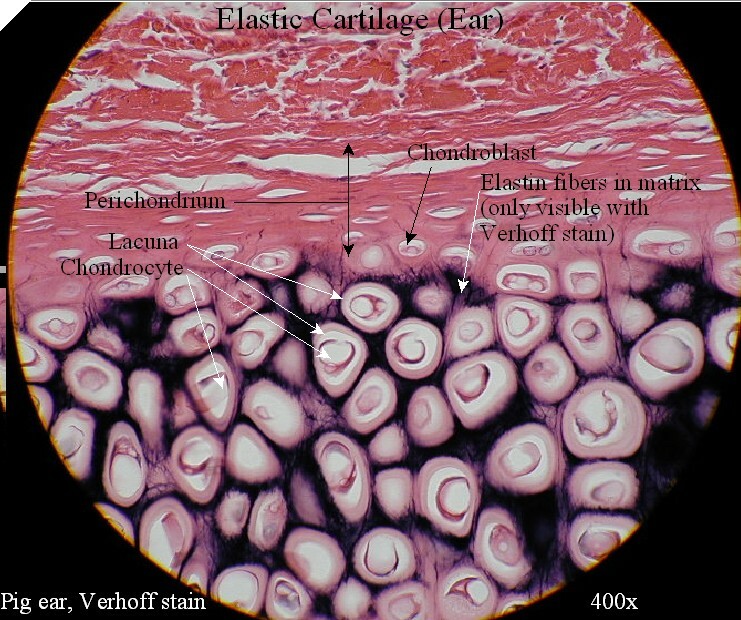 It is prominent in cartilage which give the external ear and the eustachian tubes their structures. 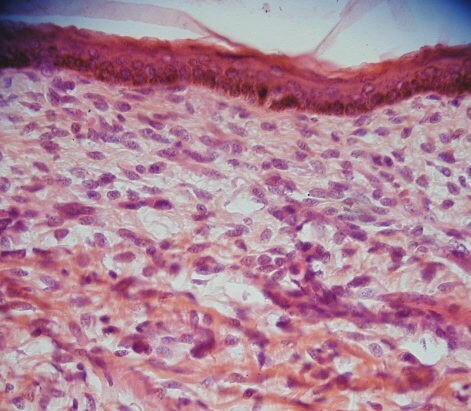 The Verhoeff stain specifically stains elastin blue, making it visible in this slide as blue fibers surrounding lacunae. View this slide first at low power to see the loosely organized pulp in the center of the disc. 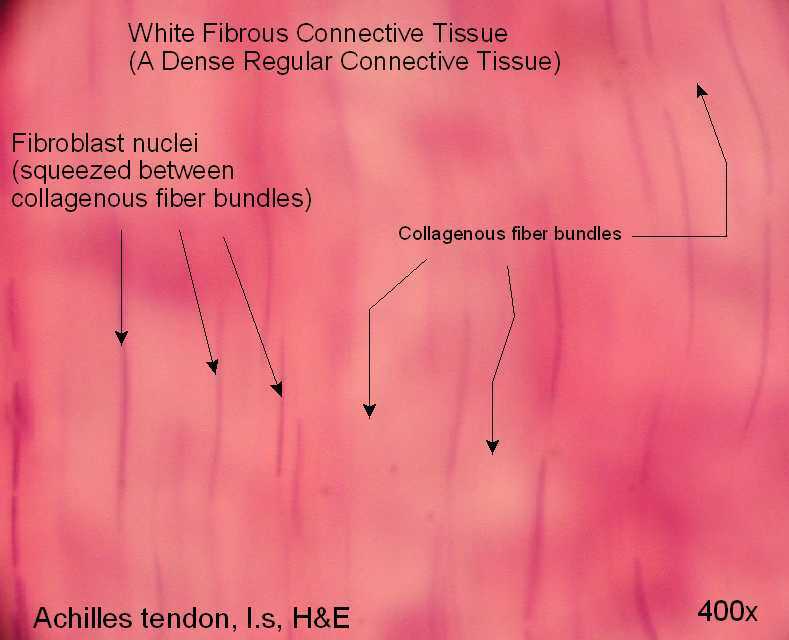 Multiple organized layers of collagen give this cartilage strength and allow it to absorb shock. It ties bones together as in the pubic symphysis and intervertebral discs and serves as a shock absorber as in the menisci of the knee. 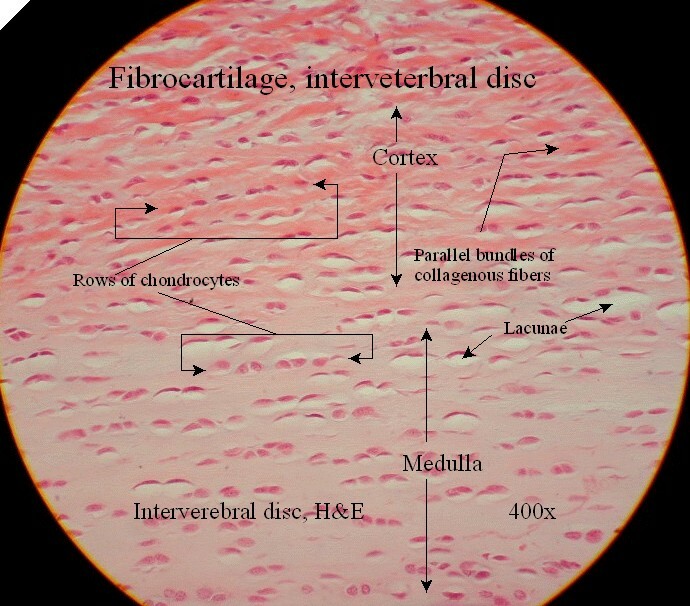 Here is a labeled version of fibrocartilage. Serous Glands embedded in the lamina propria. First review and follow carefully the rules and regulations for microscope use. Also, be familiar with guidelines in Notebook Illustrations for these drawings. Examine each of the following slides, note the features in common and those which are differentiating. Illustrate each at 400x to take up most of a page. Include and label each listed feature, and give a brief description of its function or significance. 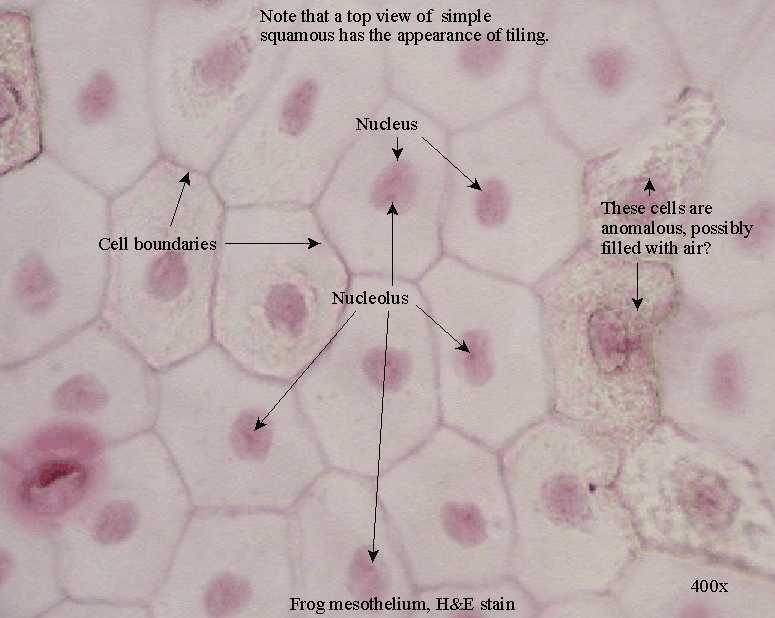 Compare with the plates in Eroschenko’s Atlas of Normal Human Histology, 9th Ed (VE). Slide 2: Simple squamous epithelium, (VE:11): top view of peritoneum, a serous membrane (an example of mesothelium, derived from mesoderm). It functions where a slick friction-free surface is required, or ready exchange across membranes is essential: lung alveoli, capillary endothelium, kidney glomerulus. Here is a labeled view of simple squamous epithelium. 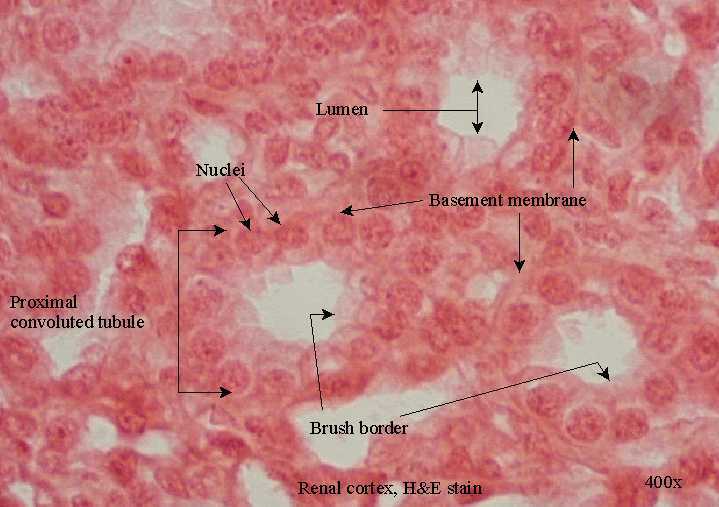 Slide 3 Simple cuboid epithelium, (VE:257) section of kidney. In the cortex (outer portion) of the section, view the proximal convoluted tubules with brush borders. Here is a labeled view of simple cuboid epithelium. 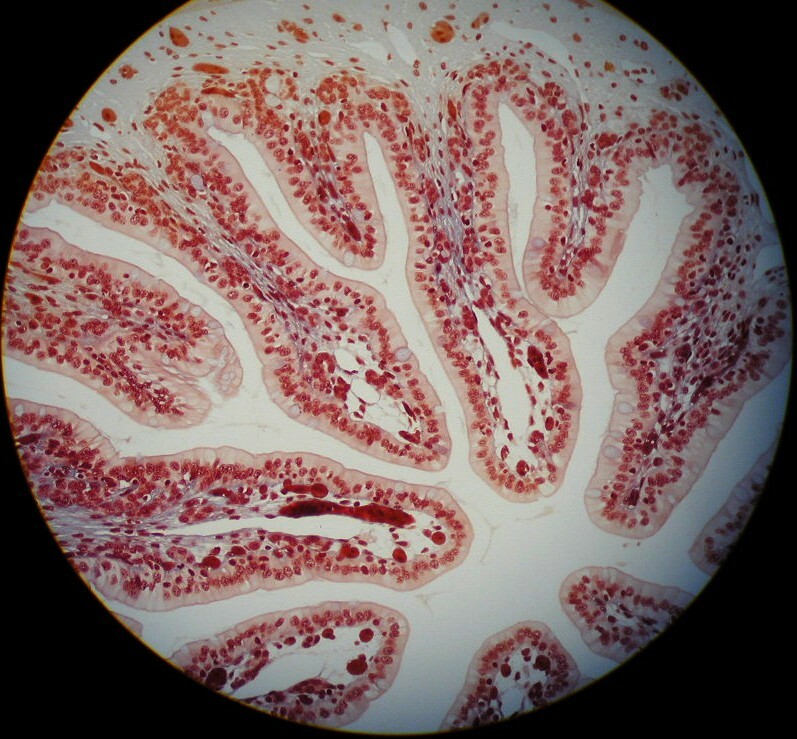 Slide 4 Simple columnar epithelium, (VE:13) c.s. of the intestine of a Nectarus (a newt). 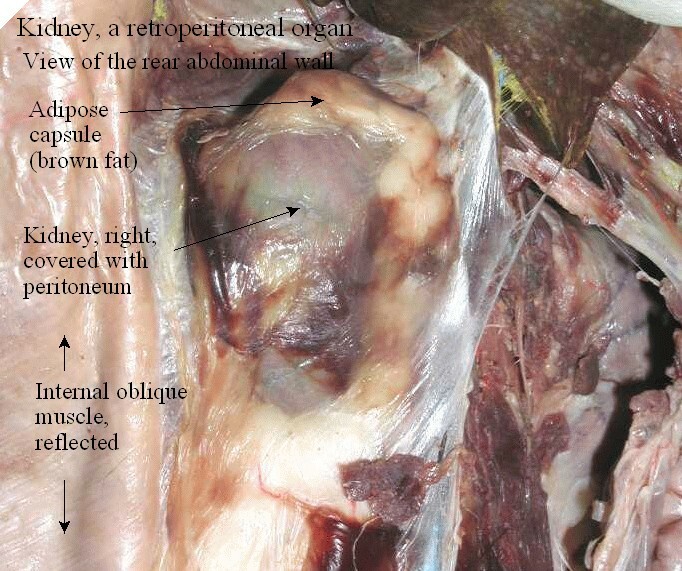 Note the classic four functional layers of a GI wall, inside to outside: mucosa, submucosa, muscularis, and serosa. Here is a 40x view of the villi. 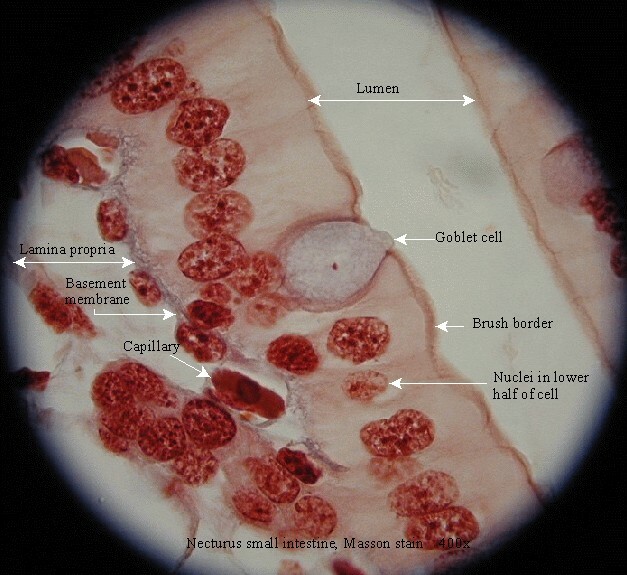 Here is a labeled view of simple columnar epithelium. 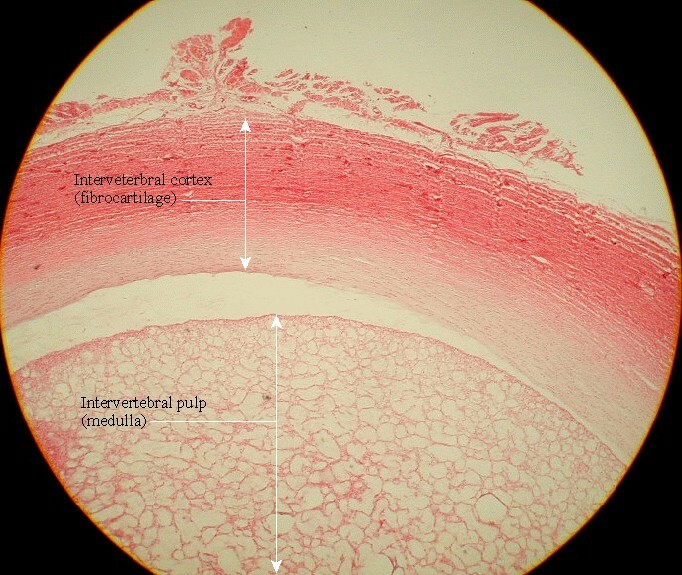 Slide 5 Stratified squamous epithelium,(VE:17) dog esophagus. This tissue is especially resistant to friction. Note the mucous alveoli of the esophageal glands. 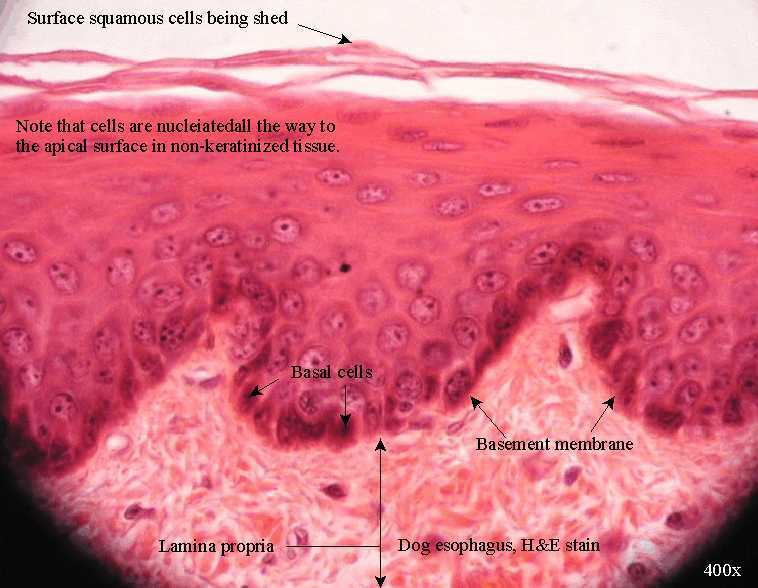 Here is a labeled view of stratified squamous epithelium. Slide 6 Pseudostratified ciliated columnar epithelium, c.s. 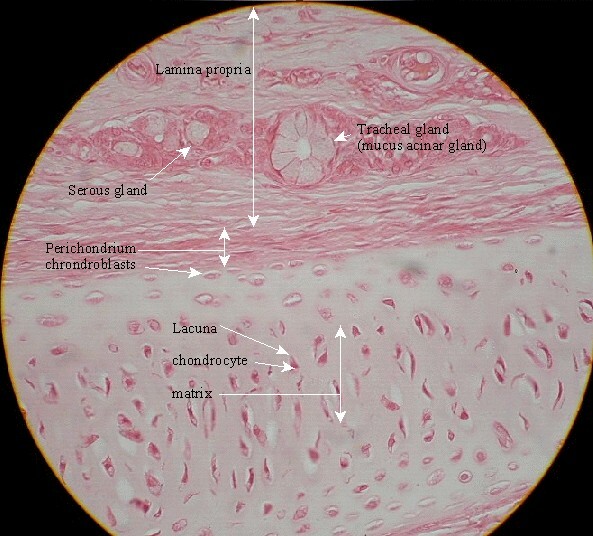 of trachea , (try slide 11 if the detail is poor) (VE:15) This tissue is especially prominent in the respiratory tree. 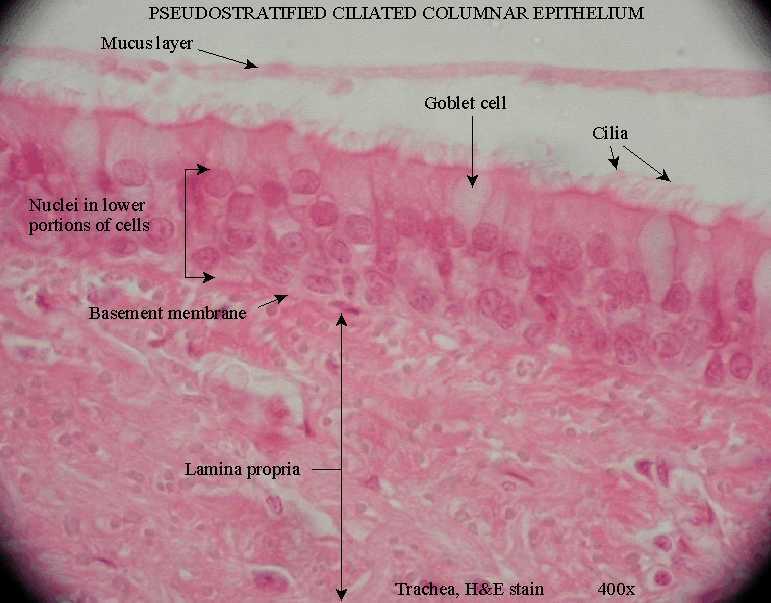 Here is a labeled view of pseudostratified columnar epithelium.